I made some significant updates to two previous posts today. The first is the port on the LIRR's VALLEY interlocking tower. 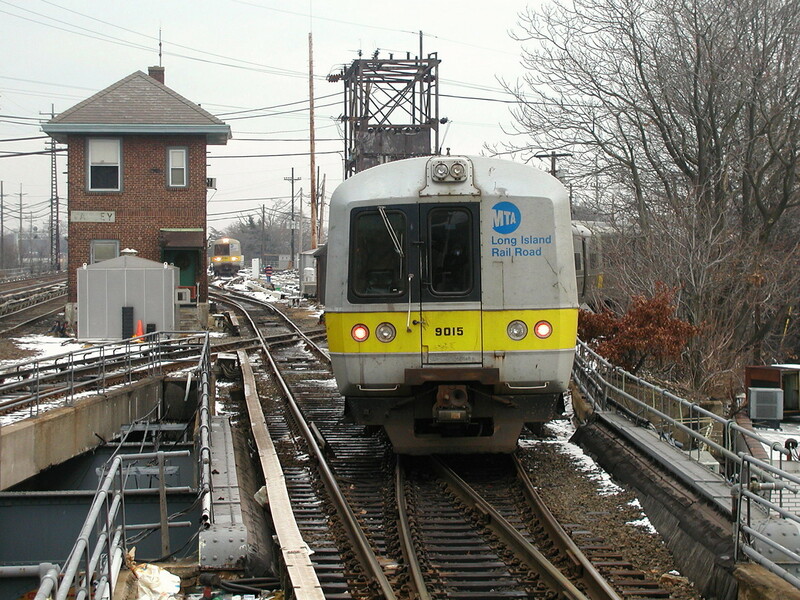 I just performed restoration on a batch of LIRR photos I took in 2003, some of which were used in that post. Back in 2003 web hosting was still expensive and download speeds slow so the old versions of the photos were over processed and under sized. I have not only corrected those problems, but also made the entire set available. The album contains photos from the LIRR when back when all the signals were position light and railfan windows were still plentiful. Also included are vintage NEC signaling pics from before HUDSON tower was closed. 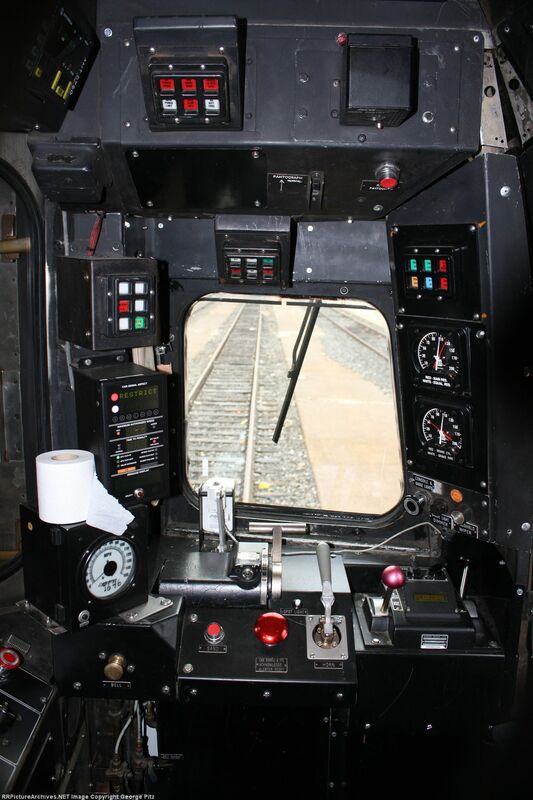 I also added a better photo of Amtrak's new cab signaling display unit to the post on Knowing your Cab Signal Displays. In addition to that I fixed some of the temporarily non-functional photo links and made a few minor revisions..
Little late for Halloween, but I thought I'd post this picture I found here. In my daily sweeps of the railfan photo scene for signaling information and news I rarely come upon others with a real appreciation of signaling. Sure pictures will have signals in them or photographers will take a few opportunistic shots of signals, but rarely do i find anyone who systematically documents signals along a particular line. Well today I would like to tip my hat to Bob Beaumont and his coverage of the Southern Tier Line from 2012 to 2013 and its slowly vanishing Erie and Conrail signaling. Bob had gone out and covered both automatics and interlockings and both the east and west portion of the line from far western NY State to NJT/Metro North territory. For example here is a rare Erie two track signal bridge shortly before its replacement. And on the far eastern end of the line here is CP-DEPOSIT, one of the few segments of track on Conrail that used spring switches and single direction absolute signals. For anyone interested in Southern Tier signaling this gallery is a must. In the inaugural post of Port Road Trips we examined STELL interlocking in its context with DAY tower, the Cumberland Valley Branch and the Northern Central Main Line. Today we will travel south from STELL, under the abandoned LEMO interlocking and then south along the banks of the Susquehanna River to WAGO interlocking, which will be covered in the next installment. To illustrate today's post I will be presenting photos taken by a railroad friend in 2006-2007. First a little background. The Enola Branch, which runs from Enola yard to the former Atglen and Susquehanna split at the former PORT interlocking south of COLA was part of the former PRR "Low Grade" system of routes that diverted main line freight trains off the Main Line through Lancaster and Harrisburg. Built in the first decade of the 20th century as traffic volumes were riding the Enola Branch was later electrified in the late 1930's and then re-electrified in the early 1980's before being relegated to backwater status as Conrail re-routed its freight off of the former PRR routes that were largely under the control of Amtrak. Part of this route was already used by the Northern Central line from Baltimore to Harrisburg and not wanting to disrupt existing operations the PRR simply doubled it up, building the new 2-track Enola Branch right along side the old 2-track Northern Central main creating a rare (for North America at least) "2 + 2" line instead of the more typical 4-track configuration. Both mains were run under Rule 251 ABS with the only break from the parallelism coming at LEMO where the NCRR elevated to junction with the Cumberland Valley leaving the "low grade" line to stick by the river. Here is a 1938 interlocking diagram of LEMO interlocking showing the NCRR and its junction with the CVRR while the Enola Branch shuns both down by the river. LEMO was the only main line diamond crossing of electrified tracks on the PRR. LEMO, originally known as J tower, was actually preserved and now lives at the Strassburg Railroad. The junction, on the other hand, with its multiple wyes and bridges, now lays completely abandoned as Conrail shifted traffic to the former Reading route. 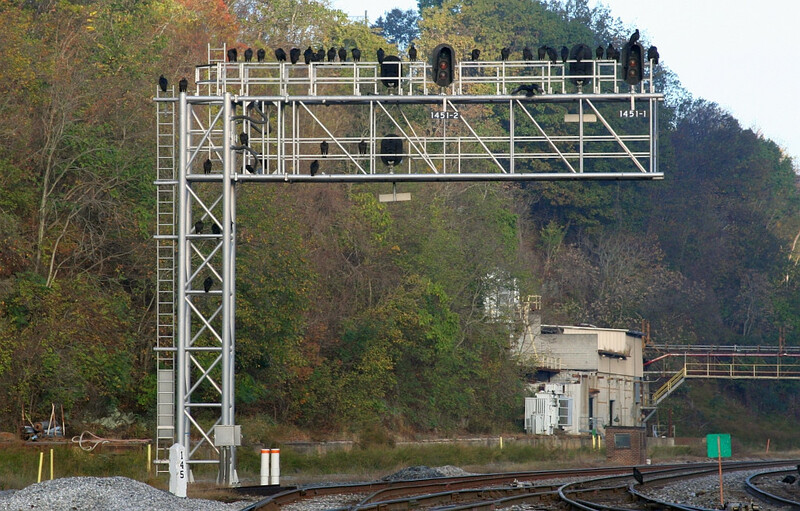 Moving our attention back to the Enola Branch we see a pair of automatic position light signals on either side of the CVRR bridge and as luck would have it these still exist as of 2013. The first of these is eastbound automatic 832E mounted on a centenary post just north of the Cumberland Valley bridge. The auto number is actually derived from Northern Central mileage from Baltimore, even thought the Enola Branch mileage counts from Parkesburg. In neither case has the number reflected the reality of rail operations for nearly 30 years. Closeup of the signal. There really isn't a lot to see here except note the lack of approach lighting. This was because when the PRR electrified a reliable source of signal power was available via the 6000 V 100Hz AC supply on the catenary poles. Without the need to conserve batteries the PRR turned on the signals full time. The westbound signal is offset a bit from the eastbound and consists of automatic 831W. This signal supports a lower | head for Approach Medium indications. For those who only know STELL as it existed in its later years with Rule 251 operation running all the way to DAY, this indication might seem a little odd, but up through the mid-80's when DAY tower was still active, both tracks from the Enola/NCRR junction at what would become STELL to DAY were bi-directional, giving westbound trains a choice. When NS adjusted the signaling on the line in the 2010 time frame the ABS block between STELL and DAY was removed, resulting in Approach being the best indication that 831W can display. Also visible in this station are one of 4 High Tension Field Switches what were part of the PRR 25Hz Traction Power System. The PRR used a single phase electrification system with power being transmitted long distances using 138 kV transmission lines consisting of two 69 kV lines operating 180 degrees out of phase. HT switchgear such as this is used to isolate sections of the 138 kV transmission line and are normally found at the 138 kV to 12 kV substation located every 10 miles or so. Switchgear such as this cannot function as a circuit breaker and therefore cannot switch lines under load. These switches were only thrown when the substations they were feeding had all been disconnected from the 12 kV overhead lines. The upper Enola Branch supported one 138 kV circuit with another two running up the other side of the river along the Main Line. At Harrisburg both of these circuits crossed the Susquehanna River via the Cumberland Valley Bridge to serve the Enola substation. At LEMO the single Enola circuit split to tap both of the Main Line circuits. The field switch was used to choose which of the two Main Line circuits the Enola would feed from.In this wider view you can sww the two 138 kV circuits from the field switch joining into one on the pole the signal is attached to. Another point of note is the lack of the 6000 kV signal power line I mentioned earlier. It could be that Conrail swapped this signal location over to commercial supplies or that they simply utilized the feed from Amtrak seen here in this view across the disused Cumberland Valley Bridge. The 138 kV circuits were removed in the 2010/11 scrapping project. Amtrak made use of only one 138 kV circuit running from the Safe harbor hydro dam via the Royalton Branch with the Enola circuit remaining idle. The next signaling location located at about NCRR Milepost 81 shows the 4-track signal bridge that used to be common on this part of the line. These were in place from the dawn of position light signaling, probably in the 1920's, all the way until the 2010/2011 scrapping project. Note I didn't say re-signaling project as while the signals themselves were replaced the logic that drove them was not. Here we see the 809/810 signal bridge looking south with the empty NCRR RoW to the right. The relay boxes are elevated due to the flooding risk from the Susquehanna River. Here is a closeup of the 810E signal for eastbound movements on the Enola Branch. Typical ABS signal, but the 2+2 layout put the northbound NCRR signal directly behind it on the signal bridge. In fact that signal was simply left in place when the NCRR tracks were ripped out! 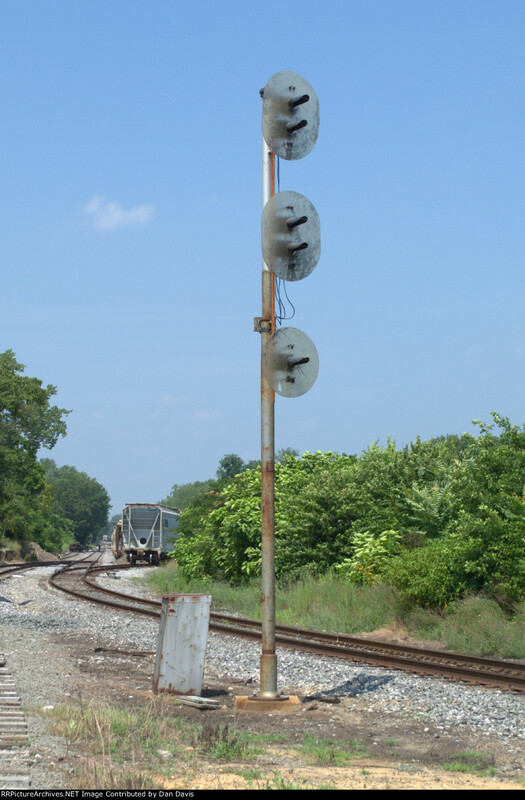 The NCRR ghost signal is plainly visible in this northward view along side the still active 809W signal. If this signal bridge looks a bit odd its because it was elevated on risers by about 5 feet to clear the wires in the 1938 electrification project. Also note the 65 milepost which as I mentions before counts from Parkesburg and clashes with the NCRR numbered signals. This one was spotted on the Winchester and Western in Bridgeton, NJ just north of the Penn St crossing. This crazy chimera is located on the former PRSL Bridgeton Branch well south of the old diamond crossing with the CNJ Southern Division. It is constructed from an old PRR Semaphore mast which used to be hanging out around the diamond and has three "heads" each with a clear (!) plastic target and one or two PL-3 position lights units for lights. What this could be used for. The W&W has no interlockings or signaled lines. It looks too complex to be a distant and the switches are hand throw. It might be something to indicate switch position (most likely) or track occupancy, but I can't tell from the photo. Oh well, at least its not a Darth Vader mast.